MUMBAI: Love knows no boundaries. It has no language for sure, and this indeed is true. Isn’t it? Would you not agree with fact that a simple hug or a kiss at times is enough to make someone feel that they are loved and cared much? But at the same time, in this world of emotions, it now appears that religion has divided people and made them insensitive towards each other. The war of religion has definitely rifted people apart. It has definitely diminished the love somewhere as people now cannot see beyond the continuous fights over small issues so much so that they do not even have that trust in each other and their religion anymore. 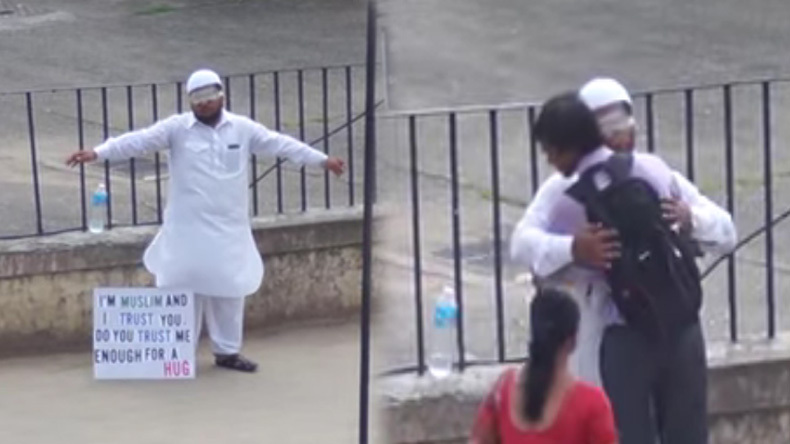 With an aim to put an end to this hatred and biased nature, this video uploaded by IdioTube shows a man named Mazim Milla holding a placard and requesting people to give him a hug in Mumbai. While his initiative left many suspicious, there was a bunch of people who easily ignored his message. His shoulders started to hurt but he could not gain the love he expected. While bearing the pain, he could only wait for someone to come forward. But as one of them showed courage to extend arms to Mazim Milla, the crowd then followed. Not only this, it also inspired some people to an extent that they wanted to even get clicked with him while hugging him. Watch the video here that is sure to bring a smile on your face and let’s end this religious war and treat everyone equal.